Over the past 6 months we’ve launched over 25 new features in Google Data Studio including: making the product free and available globally, adding support for PostgreSQL and MySQL, and providing many new report layout options. Overall feedback has been great! Now we’re adding new features to make it quicker to access your data. We want to make it easy to access all your data within Data Studio. Today we are launching a new Data Studio “Community Connectors” developer program allowing you to visualize data from any source. Community connectors are created using Google Apps Scripts and are easy to build! (our UX team even built one to monitor bitcoin prices). Once created, a connector can be shared with other users, who can use the connector to access their own data. 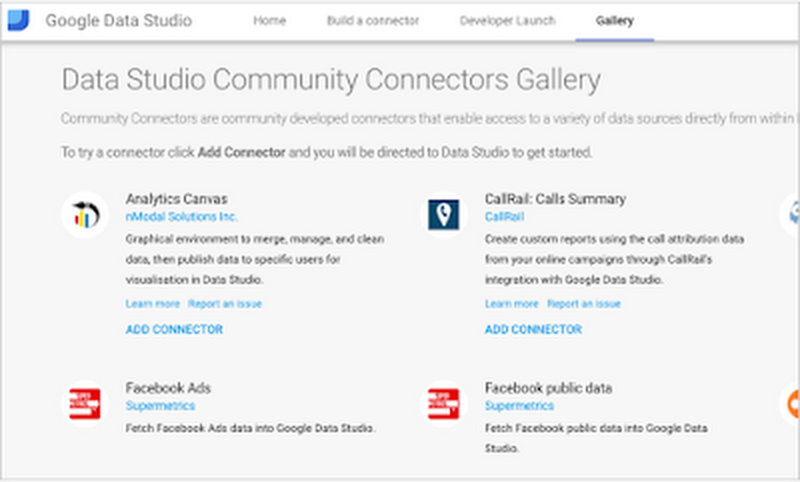 Today we have over 10 partners who have built connectors to over 200 sources and we’re excited to welcome more developers and data providers to the Data Studio community. Check out the Community Connector Gallery to explore what our partners built. Many customers want to bring Data Studio reports into their workflows or publish Data Studio reports on their own website. Now you can embed Data Studio reports in your websites and apps using simple iframe embedding. To see your report in your site, edit it, select Report > File > Embed report, then put the HTML code snippet into an iframe. Embeds can be fully interactive, and support both private, public, and non-logged in access, giving you fine-grained control over who can see your data.This new capability will allow you to share compelling data stories through your public websites and blogs, or share critical insights using your own business applications for no additional cost. Large organizations and agencies often have access to many accounts; for example, thousands of AdWords accounts, or hundreds YouTube channels. To simplify reporting, the new data control allows you to reuse a single report across all your accounts, dramatically reducing the time it takes to view data in a report. The data control can also be used to templatize reports, allowing viewers to see their data in a report without having to create anything in Data Studio. 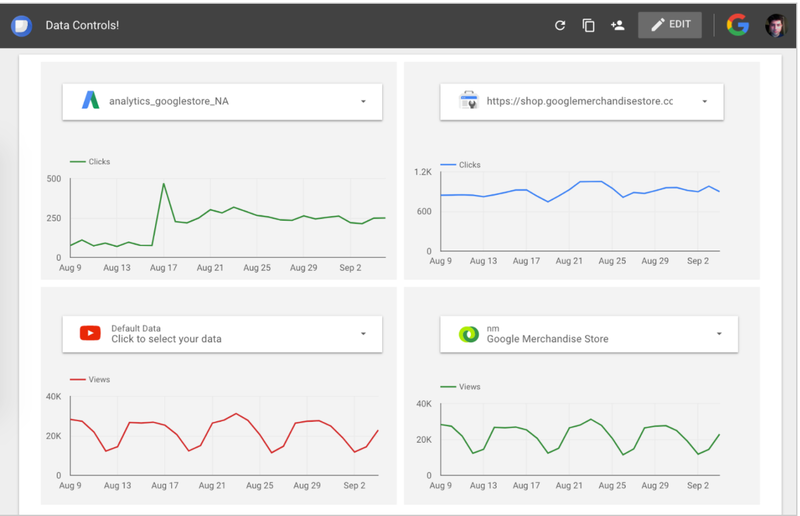 The data control supports the following connectors: AdWords (Account & MCC), YouTube Analytics, Search Console, DoubleClick Campaign Manager, and Google Analytics. We plan to add support for more connectors in the future. We’ve also added a couple of additional capabilities. You can now export any chart data directly to Google Sheets. We added a new Google Cloud Storage connector, making it easy to use Data Studio with your data in Google Cloud Storage. We’ve added SSL support for the MySQL connector. We’ve added the ability to see the totals in the table visualization. And finally, we’ve made the product available in Russia.